If you happen to go to Barili, Cebu, make sure you stop by Molave Milk Station. It is located in Mantalongon, Barili, Cebu. You can buy fresh milk, cheese, ice cream, and some snacks at the Molave Milk Station. 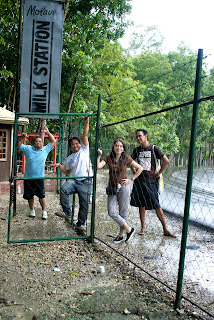 You won't miss the Molave Milk Station at the right side of the road, going to Barili proper from Carcar. They have a big signboard that can be easily spotted while traveling. Their ice cream is really GOOOOOOOD!!! Here are some of the goodies that you can buy: milk, keso, barquillos, and their highly recommended ice cream. i would like to know if we can get the contact person and contact number of molave milk station? Badly needed.